The Bodging Project has produced some unexpected results and related offspring, many of which we didn’t anticipate, and certainly we never really planned anything out in advance. But one outcome could perhaps have been foreseen. A bunch of designers go back-to-basics and learn a traditional craft. Innocent enough, but, judging from some of the criticism it has received on traditional craft websites, the project has caused some long-held prejudices between the craft and design worlds to rise to the surface. In effect, we’d strayed uninvited into neighbouring territory and territorial disputes run deep. It’s important to point out the mutual distrust works both ways. 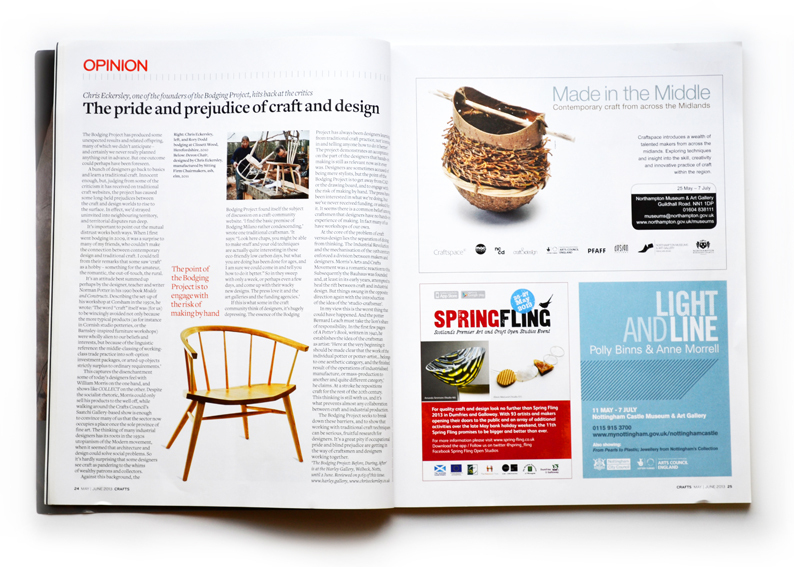 When I first went ‘bodging’ in 2009 it was a surprise to many of my friends who simply couldn’t make the connection between contemporary design and traditional craft. I could tell from their remarks that some saw ‘craft’ as a hobby – something for the amateur, the romantic, the out-of-touch, the rural. These words describe the disenchantment some of today’s designers feel with William Morris on the one hand, and exhibitions like COLLECT on the other. Despite the Socialist rhetoric Morris could only sell his products to the well off, meanwhile walking around the Crafts Council’s Saatchi Gallery-based show is enough to convince many of us that the sector now occupies a place that was once the sole province of fine art. The thinking of many industrial designers has its roots in the 1930s utopianism of the Modern movement, when it seemed that architecture and design could solve social problems. So it’s hardly surprising that some designers see craft as pandering to the whims of wealthy patrons and collectors. If this is what some in the craft community think of designers, it’s hugely depressing. The essence of the Bodging Project has always been designers learning from traditional craft practice, not ‘coming in and telling anyone how to do it better’. The project has demonstrated an acceptance on the part of the designers that hands-on making is still as relevant now as it ever was. Designers are sometimes accused of being mere stylists but the point of the Bodging Project is to get away from CAD or the drawing board, and engage with the risk of making by hand. The press have been interested in what we’re doing but we’ve never received funding, or asked for it. It seems there is a common belief among craftsmen that designers have no hands-on experience of making. In fact many of us have workshops of our own. At the core of the problem of craft versus design lies the separation of doing from thinking. The Industrial Revolution and the mechanisation of the nineteenth century caused an enforced division between makers and designers. Morris’s Arts and Crafts Movement was a romantic reaction to this. Subsequently the Bauhaus was founded and, at least in its early years, attempted to heal the rift between craft and industrial design. But things swung in the opposite direction again with the introduction of the idea of the ‘studio-craftsman’. In my view this is the worst thing that could have happened. And the potter Bernard Leach must take the lion’s share of responsibility. In the first few pages of A Potter’s Book, written in 1940, he establishes the idea of the craftsman as artist: ‘Here at the very beginning it should be made clear that the work of the individual potter or potter-artist... belongs to one aesthetic category, and the finished result of the operations of industrialised manufacture, or mass-production to another and quite different category,’ he claims. At a stroke he repositions craft for the rest of the twentieth century. This thinking is still with us, and it’s what prevents almost any collaboration between craft and industrial production. The Bodging Project seeks to break down these barriers, and show that working with traditional craft techniques can be serious, fruitful research for designers. It’s a great pity if occupational pride and blind prejudice are getting in the way of craftsmen and designers working together.